The photos in this project have been published with National Geographic, and are from multiple sightings of wild mustangs in the past year. Most are from a trip through the beautiful landscape of Monument Valley, on Navajo Tribe land. A herd of wild mustangs appeared in a clearing right around sunset. Experiencing this moment was something truly special, because this specific scene was a dream I had over a year ago. Since then, I envisioned this project coming to life, and it's something I am extremely proud of. 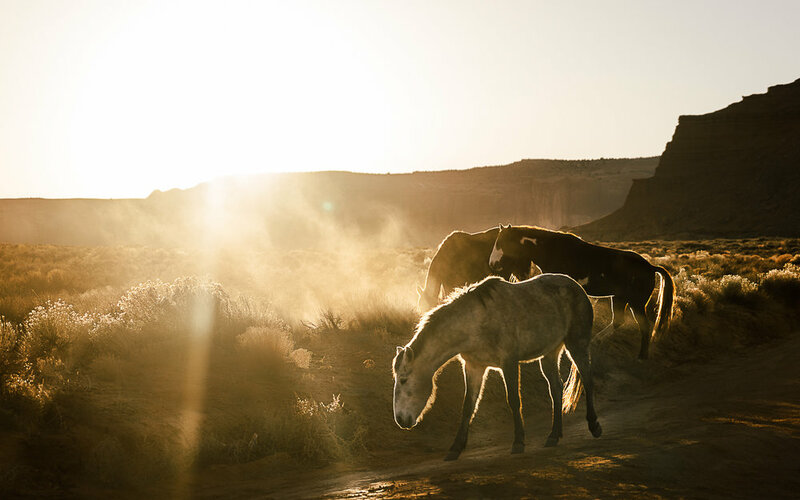 For every print sold, proceeds will go directly to Funny Farm Mustangs and The Mustang Heritage Foundation to continue their conservation efforts of this powerful symbol of the American West. Free-roaming wild horses can be found on public lands across 10 western states. Wild horses and burros are known for their intelligence and resilience. They are incredibly strong, in both body and spirit. Increasing competition for our natural resources threatens our wilderness areas and wildlife species. Most wild horses and burros living today are descendants of animals that were released or escaped from Spanish explorers, ranchers, and Native Americans. As the horses freely roamed across the Great Plains and desert Southwest, they received the name “Mustang”, which originated with the old Spanish word “Mostenco”, which means “ownerless” or “wild”. They are remarkable animals, and are interwoven into the very fabric of what is America. Recently, through a partnership with Funny Farm Mustangs and The Mustang Heritage Foundation, I was able to assist with a herd of wild mustangs and burros and witness how special these horses are. Through a eight week program called "wild to mild", mustangs initially untouched by humans are transformed into an adoptable equine companion by a process called gentling. Horses have been a constant fixture in my life, and I currently work with several horse rescues. I've always had a strong connection to them, and believe in their healing capabilities. They're honestly the best form of therapy I've ever experienced.